The Honda CB300R is a city motorcycle that would do highway runs over the weekends. However, a digital render of the bike caught our attention via YouTube, and it is packed with upgrades that make it more touring friendly than the standard motorcycle. The render also adds a few styling elements that give it an adventure look. The fascia, as seen in the render, features a beak design that is usually associated with adventure tourers. The beak isn’t the only off-road focused visual cue on the Honda CB300R render. The motorcycle is imagined with a pair of wire-spoke wheels that replace the alloys from the standard bike. The wire-spoke wheels are wrapped in dual-purpose tyres to offer better traction over loose surfaces. Enhancing the touring character of the motorcycle is a tall windscreen that sits above the stock LED headlight. A pair of knuckle guards further amplifies the adventure tourer persona of the bike. The fuel tank design remains unaltered. The saddle, however, has been imagined with better padding for improved comfort. The rear of the motorcycle features a tail-tidy kit along with a top-box mount. Apart from giving the CB300R an off-road-ready look, the rendering artist has also imagined the bike with improved stopping power. Dual discs at the front and a single unit at the back perform anchoring tasks on the rendered motorcycle. It should be noted that Honda offers accessories for the CB300R that make the motorcycle more off-road ready than the standard bike. 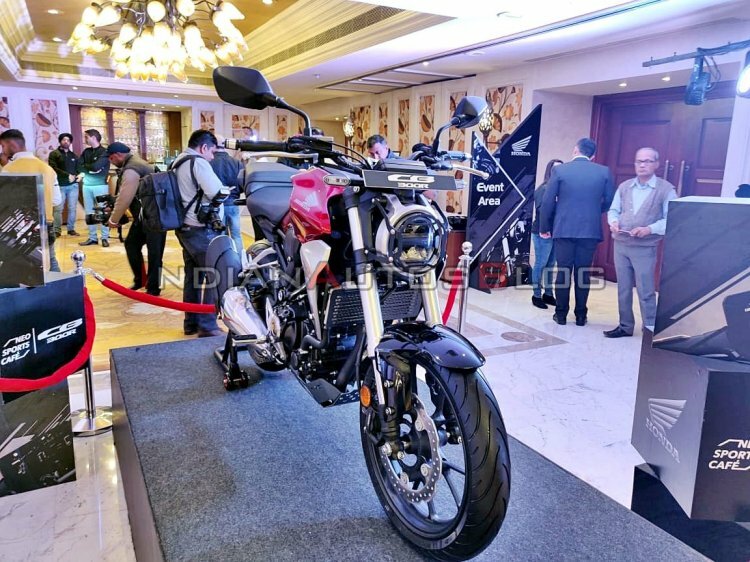 The optional accessories were showcased at the launch of the bike, and the list includes headlight grille, radiator guard, bash plate and silver finished bar-end weights. The optional accessories (pictured) for the Honda CB300R were showcased at the Indian launch of the motorcycle. The list includes bash plate, headlight grille and radiator guard among others. Honda 2Wheelers India launched the CB300R in India on February 8, at an ex-showroom (pan-India) price of INR 2.41 lakh. It draws power from a 286 cc liquid-cooled, DOHC, single cylinder fuel-injected motor. Paired to a six-speed gearbox, the engine delivers 30.9 bhp of max power at 8,500 rpm and 27.5 Nm of peak torque at 7,500 rpm.